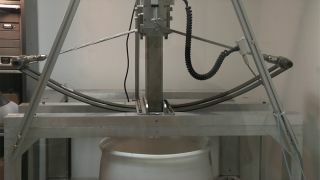 This is a photo of the ballista testbed preparing to fire a prototype harpoon into a bucket of material that simulates a comet. Captain Ahab may have wanted to harpoon a giant white whale, but NASA has a whole other target in mind. Scientists at NASA’s Goddard Space Flight Center are designing a small harpoon that would fire into and collect samples from nearby comets. Because comets are frozen chunks of ice and dust dating back to the formation of our solar system, they may hold clues to the origin of the planets and life as we know it. "One of the most inspiring reasons to go through the trouble and expense of collecting a comet sample is to get a look at the 'primordial ooze' – biomolecules in comets that may have assisted the origin of life," Donald Wegel, lead engineer for the project, said in a statement. Previous NASA missions have already found amino acids – molecules that are important for life and serve as the building blocks of proteins – in comets and meteorites. The new project could discover other ingredients necessary for life, supporting the theory that comet and meteorite impacts may have given a boost to the development of life on Earth by delivering vital biomolecules. Another goal of collecting comet samples is to figure out how comets are formed. This information would provide scientists with important details on how best to deflect any dangerous space rocks hurling toward Earth. NASA envisions that a single spacecraft would carry multiple harpoons with a variety of powder charges to handle different areas on a comet. The spacecraft would rendezvous with a comet, choose a target and fire the appropriate harpoon based on the presumed material composition of the area. The open collection chamber will gather samples as the harpoon tip dives deeper into the surface of the comet. Once the harpoon reaches its maximum depth, the collection chamber will snap shut and the spacecraft will reel it in, leaving the harpoon tip in the comet. This design will allow scientists to collect comet samples without the difficulty of actually having land on the comet. The NASA team is still in the proof-of-concept stage for the project. Once they prove that the harpoon will work, they will have to apply for funding to build the instrument.